Pretty much right after, I felt the need to cook with maple syrup. Funny how that happens. 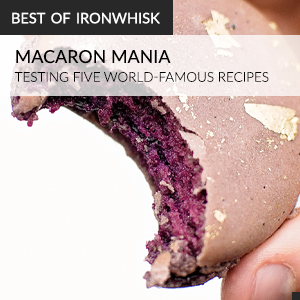 Browsing through recipes, I found Martin Picard. Picard is a famous Montreal chef who wrote an entire book on maple syrup. Sugar Shack Au Pied de Cochon has recipes for much more than just the standard maple taffy and maple candy, however. If you’ve never made maple taffy before, the process involves pouring molten sugar (in the form of maple syrup) onto densely packed snow and then spinning it around a wooden stick. I wasn’t really in the mood to go outside and gather snow. I was totally in the mood for this cake though. His maple mille feuille is dazzling. A million layers of maple pastry cream and whipped cream are sandwiched between layers of delicate, and ever so flaky, puff pastry. I wanted a slice of that cake. Since I had a lot of time to kill, I decided to whip up my own puff pastry instead of purchasing some from the store, like he recommended. I’m not sure doing so was a wise idea. The puff pastry came out great, but store bought puff pastry isn’t half bad. I don’t think the effort of folding detrempe (the butter-less part of puff pastry) and beurrage (a block of butter) until you get hundreds of layers of dough is worth it. Why spend so much effort if the results aren’t going to be much better? That’s what a logical person would say at least. They wouldn’t spend hours folding dough. They would just go to the store and buy some. However, if you have a lot of time to kill like I did, you can make your own puff pastry. Don’t though. This cake was super yummy. I loved the contrast between the flaky layers and the smooth cream. Give it a shot. Also, sorry I wasn’t around much last week. I was super busy with school work. Maple mille feuille with puff pastry, maple pastry cream, and whipped cream. Very slightly adapted from Chef Martin Picard's recipe from his cookbook and on Bon Appetit. Preheat the oven to 350°F. Cut the puff pastry into three 10 inch by 10 inch squares.To prevent the pastry from rising too much while baking, it should be perforated with a pastry docker and rolled out about 1/10-inch thick. Bake each puff pastry sheet on a baking sheet lined with parchment paper, and with another baking sheet placed on top, about 25 minutes, turning them over halfway through. The pastry is done when golden brown. Cut the squares in half so that you have six rectangles for a small, high cake or leave them as is for a large, short cake. Eat one of the rectangles and keep the rest as layers. In a saucepan over medium-high heat, whisk together the milk and maple syrup. Bring to a simmer. While the milk is heating, sift the cornstarch and flour and add to the egg yolks. Whisk until smooth, making sure no lumps remain. This step is important because any lumps will end up in the cooked pastry cream. Pour the hot milk into the egg mixture, stirring well. Transfer the mixture back to the saucepan and return to medium heat. Bring to a boil, whisking constantly. Since the mixture contains a large quantity of maple syrup, it needs to be stirred constantly to avoid sticking to the bottom and burning. The pastry cream will thicken quickly as it finishes cooking. Let it simmer for a few seconds, then remove it from the heat. Pour the pastry cream into a bowl. Lay a sheet of plastic wrap directly on the surface of the pastry cream to keep a skin from forming. Refrigerate for a few hours before using. Pour the maple pastry cream into a bowl and whisk until smooth. Transfer the cream to a pastry bag fitted with a No. 9 round tip. Refrigerate. Whip all ingredients together until stiff peaks form. Transfer the cream to a pastry bag fitted with a No. 9 round tip. Line a baking sheet with parchment paper and lay a rectangle of puff pastry on it. Pipe circles of pastry cream about onto the pastry, then top with a second rectangle of pastry without pressing down. Pipe circles of whipped cream about onto the second rectangle of pastry and top with the third rectangle of pastry without pressing down. Using a serrated knife, trim the sides of the mille feuille to create straight edges. You will have an attractive, evenly cut mille feuille. Dust with icing sugar. Ideally, the mille feuille should be placed in the freezer 15 to 20 minutes before cutting it into portions. I’m so impressed that you made your own puff pastry! I haven’t been so brave yet. This looks wonderful! 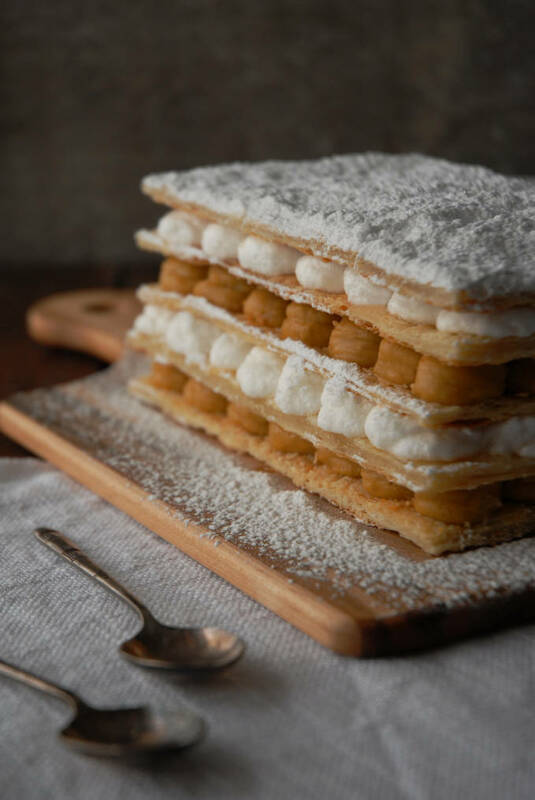 What a lovely recipe and photo Ilan, Mille Feuille is one of my favourites for sure. I haven’t tried making my own puff pastry, but perhaps one day I will; I made croissants a year or so ago and was quite successful. I’m curious about how easy it was to cut? Hey Eva, it was a pain to cut. A really big pain. It helped though to leave it in the freezer for a bit before cutting though. I love how elegant this is…and the maple infusion is just fantastic, Ilan! That is so gorgeous and stunning! I wish I could work with complicated pastry, I’ll have to be brave someday. ;) My parents always rave about mille feuilles, now I know why! Being a Canadian I clearly don’t use as much maple syrup as I should! This recipe looks so delicious and I love the sounds of the maple pastry cream, yum yum. Ilan this is absolutely beautiful! So pretty! And I absolutely love the flavor of maple syrup! I haven’t quite worked up the nerve to make real puff pastry or croissants. I’ve only made quick puff pastry, which is really good but not quite the same. Perhaps I’ll head over to your croissant tutorial soon! Smile. I love everything you make (with or without maple syrup) but this looks especially delicious. Thank you for sharing it with us today! This looks so pretty and sounds so yummy! We LOVE maple syrup, especially during this time of year when the sap is flowing and people are making it all over the place. I know I’d like this cookbook, too. These sound lovely. I had Mille Feuille for my wedding “cake” but they weren’t maple. Mmmm….looks very delicious. At first I thought it’s tiramisu :D I love maple syrup, especially drizzled over pancakes. \that looks super elegant and very very beautiful! I agree on buying the ready made puff pastry sheets rather than make your own! My husband recently has been travelling to Vermont a lot and we`ve been getting a lot of maple syrup here in Texas! Wow, this looks absolutely stunning! It sounds so delicious too! I used a serrated knife. It pretty much all falls apart though. If you’re serving this for a dinner party, individual portions may be best. Wow this looks gorgeous!!! Was it hard to make. Thanks! Nope. It comes together pretty quickly if you use store bought puff pastry. Mille Feuille AND maple syrup! Two of my favourite things together. Amazing! Making it as soon as I can. It looks amazing and would love to make it this weekend! What is icing sugar? Also, what kind of maple syrup? Icing sugar is the same thing as powdered sugar and is the white topping that you see on the cake. It is a very, very fine sugar. As long as you have real maple syrup you’re good! Ooh a maple syrup based cream sounds intriguing. I love that part of your instruction is to ‘eat of the pastry and use the rest’. Lol!